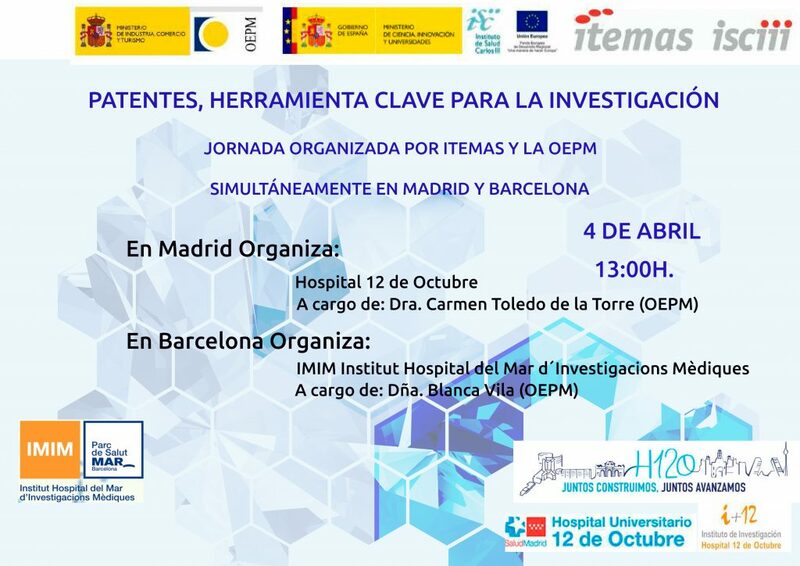 On April 4, 2019 it is expected that the ITEMAS Platform (Platform for Innovation in Medical and Health Technologies) through its nodes, Hospital Research Institute October 12 (I + 12), and Medical Research Institute of Hospital del Mar (IMIM) celebrate the conference “Patents, Key tool for Research in the Healthcare Environment “simultaneously in Madrid and Barcelona in collaboration with the Spanish Patent and Trademark Office (OEPM). 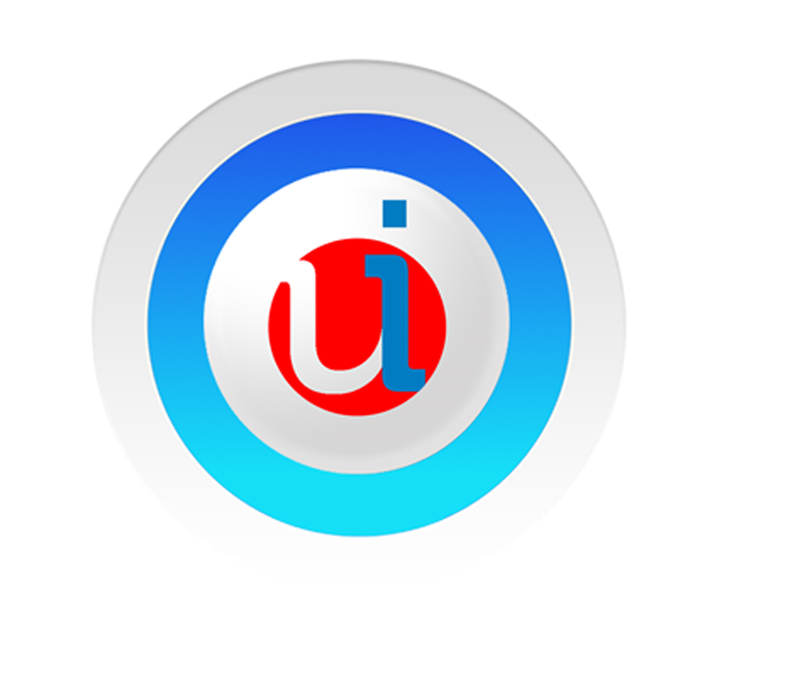 The objective of these conferences is to inform health professionals and in particular researchers, the value of the patent as an instrument to enhance innovation in the organization. The presentations will be borne by Mrs. Carmen Toledo, Head of Technology Information Unit, in Madrid, and Mrs. Blanca Vila, Head of Documentation and Search Area, in Barcelona, both belonging to the Patent and Technological Information Department of the OEPM. Some of the points that will be addressed in both days will be about what is a patent, what can be protected as a patent, what steps have to be taken before applying for a patent, what support services does the OEPM offer in this area, and how to use it, free databases for the identification of the state of the art in relation to the invention that is intended to be patented, among other topics of interest. Both days will take place from 1:00 p.m. to 2:15 p.m. in the auditorium of the Hospital 12 de Octubre, in Madrid and in the Josep Marull room in the Hospital del Mar, in Barcelona. 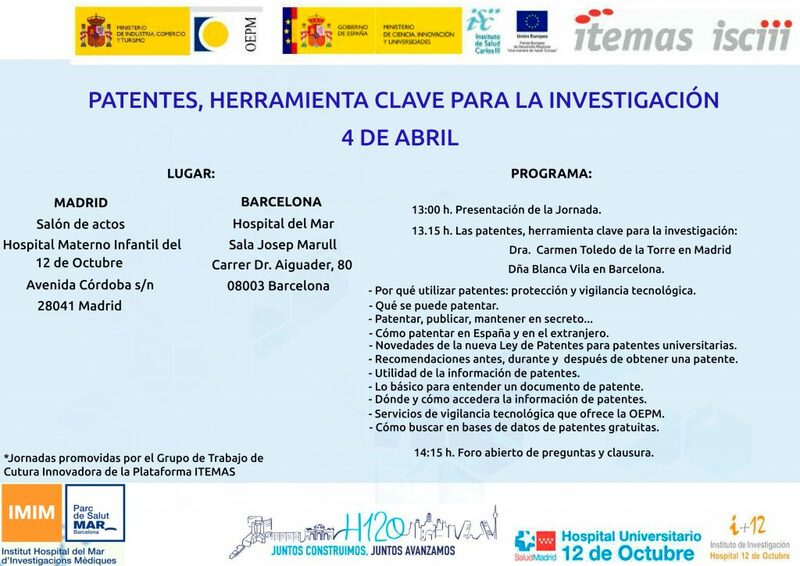 These seminars have been promoted by the Grupo de Trabajo de Cultura Innovadora of the ITEMAS Platform.